Let’s just get straight to the point that the Australian Taxation Office (ATO) will not like you AT ALL if you pocket your cash sales. I’m talking about the scenario where you may receive actual cash money for sales made. Lets play it out; Your customers pay cash and instead of you taking that money, running it through your till and banking it, you take that money as the business owner and you put it in your back pocket, as part of your “wage”. You are declaring lower sales and therefore are paying less GST to the tax man. You are also declaring lower profits and therefore paying less tax (Income TAX). 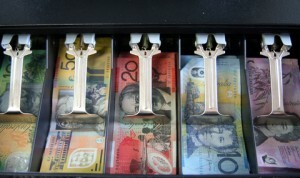 So if you are “back-pocketing” cash sales in your business; my warning to you is BEWARE!! If the tax man finds out about it he will HUNT YOU DOWN and you will end up paying the consequences. Now why is it MORE important for YOU NOT to do this? Why you could be HURTING your business by pocketing those cash sales? By not recording and tracking this money and controlling it, I am pretty sure that you don’t have all or any checks and balances to make sure money received in cash balances back to your deposits slip, which balances back to the amount deposited into your bank account. If you do not have those checks and balances in place, and you have a new staff member or (an opportunistic existing staff member), you are basically leaving an open door for them to help themselves to that cash. So instead of you “back-pocketing” it, they are!! And you have no way of proving otherwise!! My tip: make sure that your customers know that for any Cash amount paid – a receipt must be issued. So at your register, print a simple sign saying: ‘if you’re paying by cash, please insist on a receipt’. That way you’re not going to phone them up later presuming they haven’t paid, and destroy the relationship that you have with your loyal customers. By under-declaring your sales; you’re not able to see what the split is in volume in how many products you sell in the different areas during the year. Your numbers are going to be out; they’re going to be distorted. If you are taking those cash sales and putting them in your back pocket, how do you know that the decisions you’re making based on what your are selling, or where your market is, are indeed correct. Because you are obviously under declaring your real gross profit, your earning from these products and services are also distorted. Your cost is going to be correct, but the sales matched to that product is going to be way out. Now your REAL gross profit earning made on those different products are understated and if you are making a decision based on which products and services made the most money (in less time) – you have no accurate information on which to base it. You have no accurate past information in order to prepare an accurate plan for the future (Budget). The most accurate of budgets are those where past information has been analyzed and scrutinized, and then future values are accurately projected. For example, if you are posting / couriering your product to your customers, you may be able to work out a reasonable percentage of how much is spent on postage/courier based on sales..because the cost is related to the sale. But, if you are distorting your sales, your percentage cost is not going to be accurate…so you will never really be able to accurately plan how much is “generally” spent in that area. Whats worse…is that your budget is the foundation to accurately having a cash flow forecast prepared…. So if your budget is not accurate, then neither will your cash flow forecast be…. and that means you are robbing yourself of the opportunity of comfortably knowing what your bank account would look like in a few months time. In a few years time, you may want to sell your business. Unfortunately you have been under-declaring sales, which means you have been under-declaring profits…and last time I checked…there arent very many people out there who are breaking walls down to buy a “un-profitable” (or not so profitable) business! So as you can see, you’re actually hurting yourself more than the tax man by back-pocketing any sales from your business. Love your article on pocketing cash sales! Two other reasons which weren’t included and are also important is when the owners are considering selling their business – the cashies are not included and can “devalue” the business or not reflect the real value of the business, which means they will not be able to secure the selling price they wanted or should really be realising. Another reason is when they apply for finance or a loan the finance company may not take the cash sales not recorded into account and therefore may not approve finance or approve a much lower amount. Both of these reasons will be hurting the business owner more than the Tax Man. Keep the articles coming – love reading your thoughts. Thanks Sonja for your comments!! So true that “cashies” hurt the business owner not just NOW – but also in the future!! Well done! !